AGI congratulates Dianne Snowden, AM, PhD, MAAGRA, on being appointed a Member of the Order of Australia (AM) in the Queen’s Birthday Honours List, for services to heritage. Dianne is a professional genealogist and historian based in Tasmania and she is President of the Australasian Association of Genealogists and Record Agents (AAGRA). AAGRA is the accrediting body for professional genealogical researchers throughout Australia and New Zealand, comparable to AGI. Dianne is a regular visitor to Ireland for research purposes. With the Wicklow historian Joan Kavanagh she wrote Van Diemen’s Women – a History of Transportation to Tasmania, published in 2015 by The History Press Ireland. 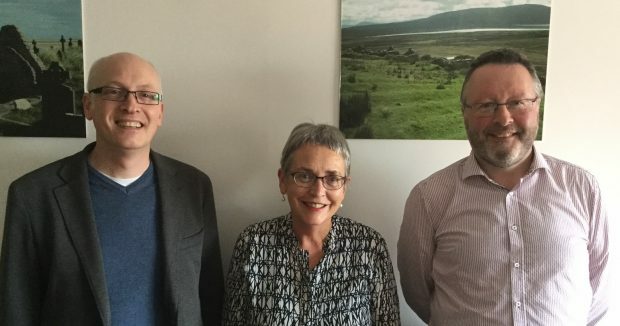 Dianne was in Dublin last week when her new honour was announced and her visit gave AGI Members Steven Smyrl and Paul Gorry the opportunity to congratulate her. Dianne will be back in Dublin to speak at the Global Irish Diaspora Congress on Thursday 17 August. Her subject will be ‘Children on Board: the forgotten children of Irish convicts transported to Van Diemen’s Land’.